In a medium saucepan, combine cranberries, orange zest, water, sweetener and cinnamon; bring to a boil over medium heat. 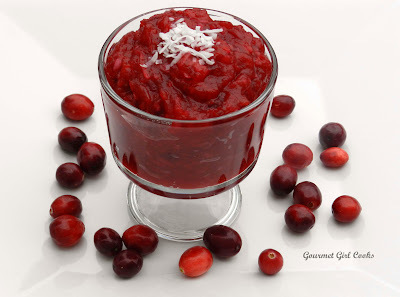 Reduce heat and simmer gently on low for approximately 8 to 10 minutes, stirring frequently, until most of the cranberries have popped and sauce has begun to thicken. 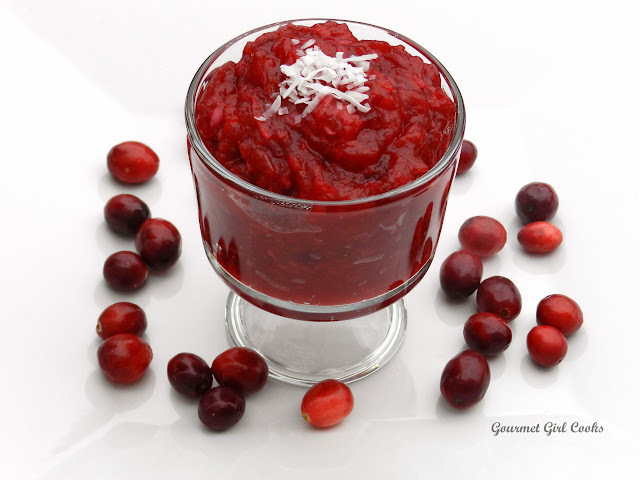 Lightly press (smash) cooked cranberries with back of spoon or potato masher; stir in coconut. Cool in pan for about 15 minutes; transfer to a bowl or serving dish, cover and refrigerate until thoroughly chilled. Serve garnished with additional coconut, if desired. *Optional - Reduce coconut to 2 tablespoons and add 1/4 cup chopped pecans. Forty-eight degrees? We are much colder here in the corner of Clallam County, WA. Nice-looking recipe ... it will warm our tummies and hearts when I prepare it. Thank you for sharing so much and all so deliciously displayed. Season Blessings to you and loved ones. This does, indeed, look awesome! 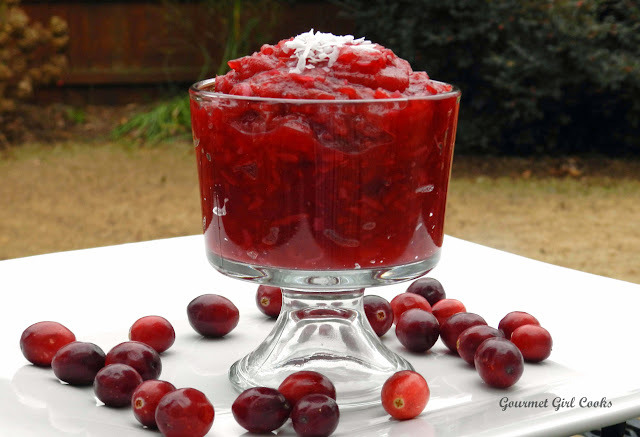 I have lots of cranberries in my fridge and freezer. I'm going to try this next! It was cold today, but sunny. We've been having some crazy weather, too, but not like you have had. Sounds like the ice storms out west have ruined the avocado crop. I don't like the sound of that ... a day without avocado is like a day without sunshine! I just made this sauce to take to a Thanksgiving family dinner. It's so delicious! 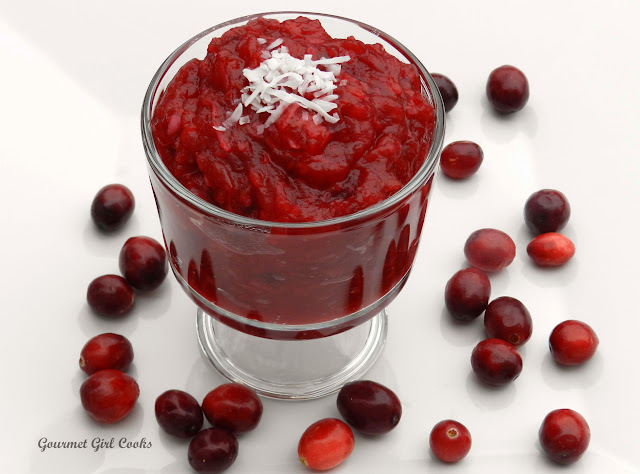 I never knew the taste of cranberries could be so yummy without being loaded with sugar!! Thank you for this recipe. Wanted to come and tell you that I made this sauce and it was delicious. 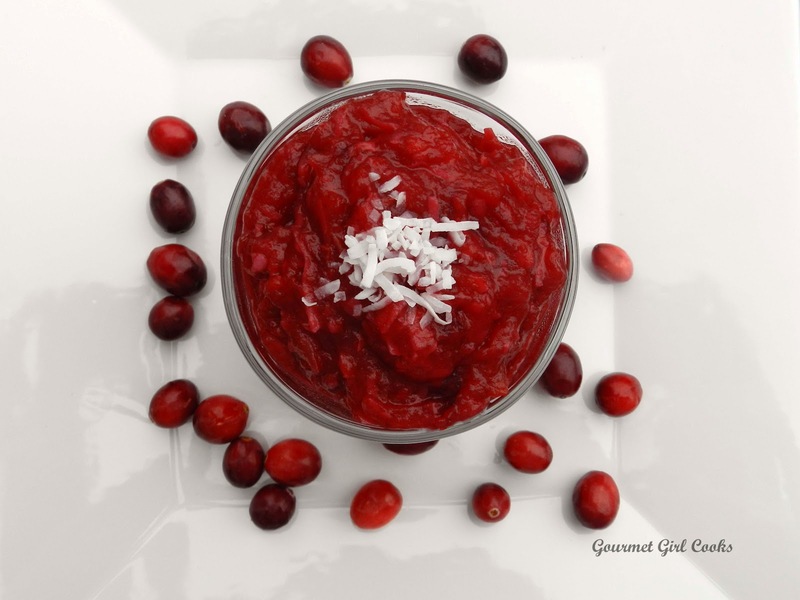 My brothers both said they didn't like cranberry sauce because we've always only had the canned versions but they agreed to taste it and they almost didn't leave enough for me! This will be a staple for my Thanksgiving meal for years to come. Thank you so much! You're a doll! I just made these and got them out of the oven and had a bite. It was good and reminded me of cheese danish, but I'm saving it for breakfast tomorrow-too late at night for treats- But , I have a Q about the measurements though. It said 2 cups or 8 oz of mozzarella cheese. On the side of my glass measuring cup, it says 8 oz at the 1 cup measure. So 2 cup would be 16 oz. I wasn't sure which to do, so I did the half way mark between 2 cups and 8 oz which was 1 1/2 cups. I thought that was a safe middle ground. What do you think?